Learn with Play at Home: Playing and Learning with Loose Parts. Tanabata Stars. When the stars arrived, we were not disappointed. They are beautiful. There were gasps when we opened them and we were drawn to get them out. You may want to start just by mixing those beautiful colours together like we did, or perhaps you would prefer to get them out and stack them according to colour. Whatever you do, there is sure to be a great deal of play and learning ahead that includes these stars. See the bottom for your chance to win a set. There are 100 stars in the set in total. 7 different coloured groups of 10 stars and 30 plain wooden stars with numbers 0-9 printed on one side. (3 copies of each number) This definitely makes this set a fabulous teaching resource. Hint: If using wooden materials with playdough, I recommend using a homemade playdough version to prevent staining. My kids unfortunately used a bit of store-bought playdough and some of the colour lightly stained some of the wood. Learning and understanding the combination of numbers that make up to 10 is important for children. The skill to "make to ten" helps children to understand our Decimal System (Base 10) and aids with mental addition, subtraction and further mathematical concepts down the track. Using some coloured counters/loose-parts along with a tens frame will help children to physically manipulate the materials and see for themselves the combinations that make 10. The more they experience and practice this, the better their understanding. Tens frame (download and print your own tens frame here) I laminated ours for extra durability. Encourage children to count out and place 10 counters/stars in the tens frame ensuring that there is only one counter per space. How many different number combinations can they come up with using the 2 colours? To simplify, record the answers for your child or use wooden numbers to show your results. Younger children can enjoy and practice simply counting up to ten and the one-to-one correspondence of putting one counter in each space. One of the most joyful things about children playing and discovering in a hands-on, playful manner, is watching the joy, excitement and pride they display, when they achieve, learn and make their own connections and understandings. Here are a couple of others ways that we have played "making 10." Tanabata stars/counters/bottle tops etc. 2 of each number 1-9 (on counters/bottle tops etc. you can add your own numbers). The person with the most pairs at the end is the winner. When children turn over one number, talk about that number and ask "which number do you need to find to make ten?" (ie. Maddie turned over a 2 first. She figured out that she needed to find an 8 in order to make a pair). You can provide extra counters/manipulatives for children to count to assist them in figuring out the combinations that make ten or for adding the two numbers together. She beat me! (and I didn't let her win). As you can see, we have had a fabulous time so far playing and learning with our Tanabata Stars. They are a gorgeous addition to our loose parts play and would make a special and unique gift. To purchase your own set, head here and to browse the rest of the Sweet Elephants store, see here. * This giveaway has ended. The winner will be contacted shortly. "Which gift would you give to someone and why?" Terms and Conditions: This competition has ended. Must leave a name and email address if using "anonymous" or a profile not linked to a way to contact you if you've won. Winner will be deemed most creative/interesting response as chosen by us. This is a game of skill, not chance. Entries open 12.01am Tuesday 4th Nov and close Monday 10th Nov 11.59pm. Judges decision is final. Winner must respond within 48 hours or prize will be awarded to the runner up. Good luck. What a fab list of ideas to use for these stars! Wow what a gorgeous selection at Sweet Elephants :-) I know my boys would just ADORE the mammal skulls -- they are very into skeletons at the moment! My boy needs some flame stickers for his balance bike... they are SO cool! I think we might post some up to my nephew too.. nothing like gifts that are easy to send! Loving those stars... and you get heaps! So often with toy sets you never get quiet enough for one child to really explore, let alone two or more kids! What an incredible website! There are so many great products. My little girl is really starting to love imaginative play and so I think she would love the personalised superhero capes. I can just see her zooming around the house and garden. Also, those Tanabata Stars are incredible and I love all the many ways you can use them to help children learn through play. Oh I would definitely give those beautiful 'Rainbow Blocks' as a gift because I know as an early years educator how many hours of open-ended fun they inspire in my groups of three year old children!!! They are especially beautiful on a light table or with a rope light on the floor. Motherscorn Eco-friendly Touchable Stackable Bubbles seems to be a perfect christmas present - it will definitely motivate kids to play outside for a long time..
Do we have to give them away? ;) The personalised Superhero Cape would be an instant winner for my boy's mates - but I'm looking at the Rainbow Blocks for a friend's baby shower gift. I love that they will be a long lasting gift - babies would love the reflected coloured light, as they grow they can build and create, then learn about mixing colours... and everything in between! Plus they are gorgeous! Wow I have absolutely fallen in love with these Kiko Tanabata Stars! I love the colours and the fact there are so many to be played with. I can just imagine my 4 year old and 21 month old boys being engaged with these for hours! The possibilities are endless and this post has inspired me to expand on my loose parts for play, thank you! I love the photos you have posted with lots of great ideas. There are so many great gifts on Sweet Elephants. The Spitting Frogs are perfect for the warmer weather but I am really drawn to Zoras Wooden Rainbow, i think it would make a great gift for kids of a range of years. The eye spy bags are great too, would be so handy to take to appointments or to keep little ones busy in the car. 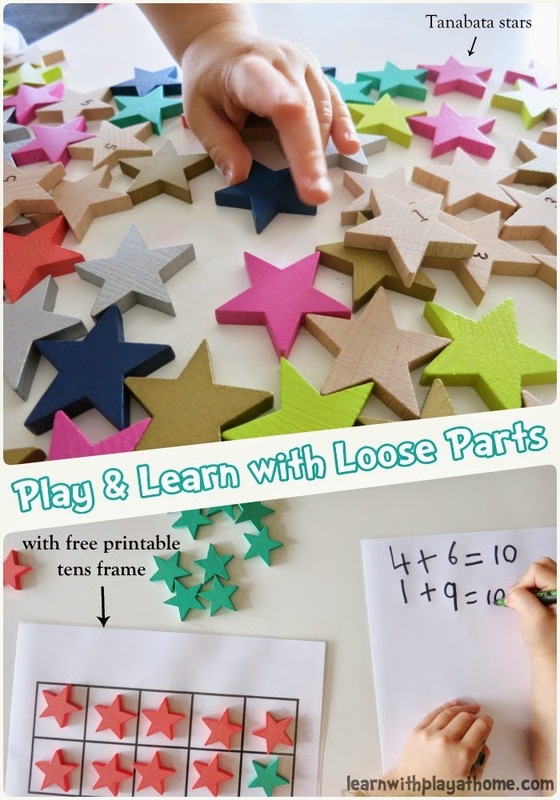 I love loose parts play and these stars have just made my wishlist! You have done a fabulous job at showing their versatility! I never realised that Sweet Elephants had such thoughtful gift ideas either, so I'm thrilled to have found them through you! I have fallen for the sensory bags and would give them as a newborn present! I could see them being used for such a long time, first visually in black and white then colour as the description suggests, then through touch and I could see that my now 12 month old would still love to play with them carrying and moving them throughout our house. Not many toys truly span that diverse developmental range! What a gorgeous giveaway! My son has dominoes and plays with them every single day. I am constantly amazed at what he comes up with to do with them. His are the standard rectangle shape, so I would love to give him a set of these colourful stars to see where that would take his play and exploration! Oh my, I adore these stars. They are seriously adorable. You are so clever, there's so many learning experiences here with just one product! I'd buy the Kinetic sand for someone as a gift. All my girls adore it so I know it would be a hit with any other children! From bubbles to backpacks and toys galore, my chosen gift from The Sweet Elephants store would have to be a Fairy Door!! Because my little girl just loves inviting her garden fairies indoors! What a sweet website, jam-packed with gorgeous product! I love the stars. They remind me of the cuisinaire rods I used to play with/learn from as a kid. Would much have preferred a star version! I'd love to win a set for my Granddaughter, she'd love them to bits. Thanks for sharing. hese gorgeous stars are such a versatile resource to have on hand. The possibilities seem to be endless. Sweet Elephants has such a fantastic range. I can see so many things there for each of my children. The one item that stands out to me is the letterbox because my 4 year old daughter loves writing and receiving mail. She "posts" her letters into a cardboard box and we all write back to her. The letterbox is adorable and I'm sure she would love this. The Upper and Lower case letter stamps would be a perfect gift for my daughters friends, who are all heading to school next year. We have been making our own writing boxes for each of her friends for birthday presents. The writing box we made for our daughter was a complete success. Thanks to you Deb for the inspiration. These stars would fill my littlest grand-daughter's heart with delight. She will be three next year and she loves, loves, loves all things that she can sort, count, build and explore with. I can see her sitting for hours on my loungeroom floor playing with me while we play with these stars. I know she loves coming to visit but how much more would she enjoy the experience knowing these were at Grandma's house. I'm sure there would be lots more requests to come and play. Thanks for sharing these and the fun ways to play. Wow, the stars look amazing. The kinetic sand has to be my top pick. The fun that kids can have with a different texture, not playdough again and again, And no mess for mum. Amazing!!!! Those stars are really awesome…and the play possibilities are endless! I would get the mini wooden ten pin bowling set as a family gift for my daughters, hubby and me this Christmas. I love to include a few gifts that encourage us to play together. I've been a parent for 13 years now and wooden blocks are one of those toys that last and kids play with for years and years. They also assist in all kinds of imaginative play. That is why I would give them as a gift! So many wonderful gifts to choose but I think my son and I would enjoy the Safari Ltd World Landmarks best. He is 3 now and fascinated with his globe of the world, these would be a great way to teach him about the world and so much fun for both of us! The Safari miniature toys - world landmarks - I would give it as a gift to inspire a desire to travel and learn about other cultures. I would love to give the Rainbow Window Blocks to my 3 gorgeous grandsons..they would be wonderful to use with the light table and keep these little boys intrigued, interested and involved for years to come. Would love the kintec sand. I have ocd and therefore hate normal sand. Lol. This would be great for my 3 kids as the love sand and building and creating. The gift I would like to give another family is this set of gorgeous stars. We've been looking at them for months now and are just so impressed by their versatility. They really bring families and siblings together. And even better they suit all ages. 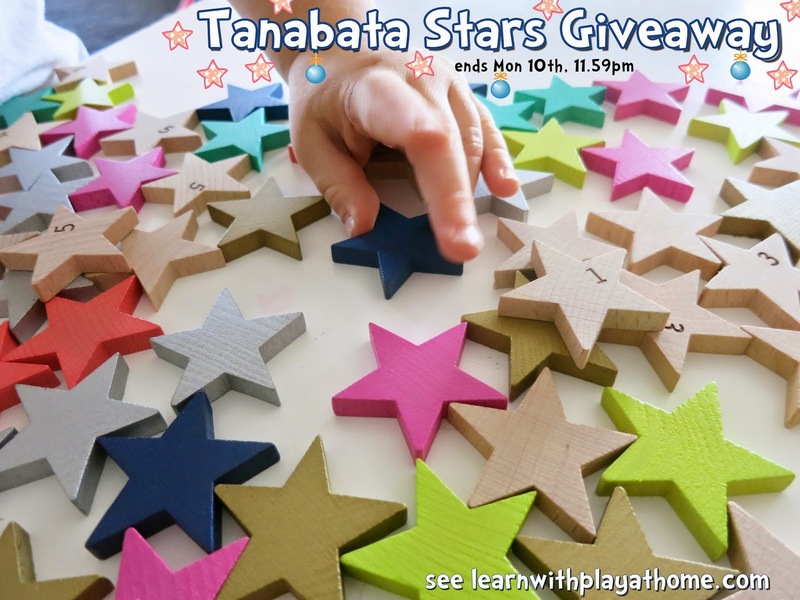 My friend has ages ranging from 2 to 8 and I know that each of her boy would love spending time playing with the Tanabata stars. I can picture their smiles now. And that to me is the spirit of Christmas... Happiness! Thank you Deborah for this amazing post displaying the versatility of this fabulous wooden toy! We are absolutely loving everyone's entries and thank you for your kind words. Wishing you all the very best of luck as we draw closer to announcing the winner. I think the Dear Little Letterbox would be the perfect gift. So many activities and learning could be done with this as a jumping off point. I think my twin four year old daughters would think the Lil Fairy Door was just crazy :) So that and then those tanabata stars are hard to go past they look incredible! My goodness it's hard to choose just one thing (I don't know how you did it!!) but since I do have to choose one, I'd have to go with the Manchi Paris magnetic toy. Apart from looking absolutely beautiful, it creates a great chance to discuss different cultures, as well as the science of magnets. Not to mention it looks great fun to play with - I have visions of block versions of the great cities of the world all over a loungeroom floor, how amazing would that be?! I love the Machi sets. They are absolutely gorgeous. I would choose the rainbow blocks to give to my son. They are beautiful and I've been admiring them for awhile now! I would choose the 'counting bird in hand game' for my 3 children aged 6,5, & 3. They love numbers, counting and playing together! Thanks for your entry Emily. It was a runner up. Sweet Elephants would like to offer you 10% off the stars if you wanted to purchase them. Just drop us an email and we'll give you the code. Thanks for your entry Ali. It was a runner up. Sweet Elephants would like to offer you 10% off the stars if you wanted to purchase them. Just drop us an email and we'll give you the code.